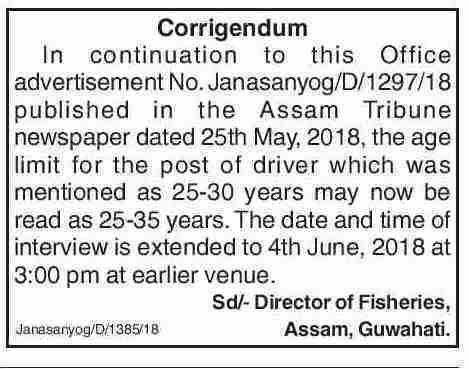 O/o Director of Fisheries, Assam. 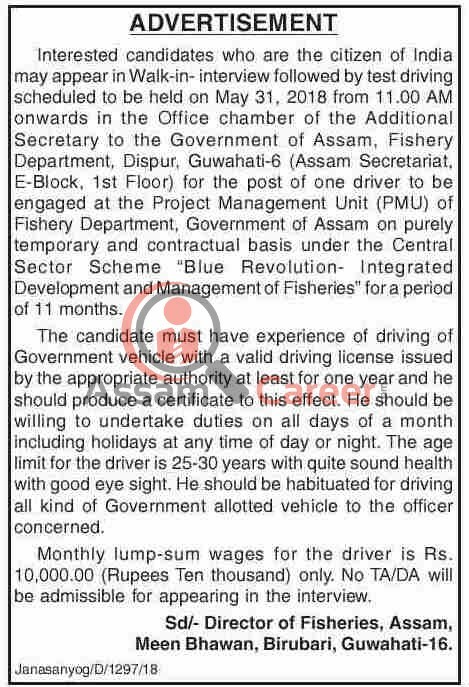 Government of Assam on purely temporary and contractual basis under the Central Sector Scheme "Blue Revolution - Integrated Development and Management of Fisheries" for a period of 11 months. Educational/ Other Qualification: The candidate must have experience of driving of Government vehicle with a valid driving license issued by the appropriate authority at least for one year and he should produce a certificate to this effect. He should be willing to undertake duties on all days of a month including holidays at any time of day or night. Age: The age limit for the driver is 25-35 years with quite sound health with good eye sight. He should be habituated for driving all kind of Government allotted vehicle to the officer concerned. Pay: Monthly lump-sum wages for the driver is Rs 10,000.00 (Rupees Ten thousand) only. No TA/DA will be admissible for appearing in the interview. Venue: The Office chamber of the Additional Secretary to the Government of Assam, Fishery Department, Dispur, Guwahati-6 (Assam Secretariat, E-Block, 1st Floor).